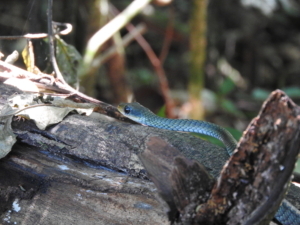 Whilst counting Capybara, Katja and Helmut Seehawer found a wonderful green snake in the REGUA wetlands. 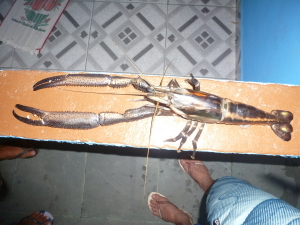 It has been provisionally identified it as Chironius multiventris. If this is confirmed it would be a new snake for the REGUA snake species list. The Chironius family of the Atlantic forest consists of five species of elegant green, grey, brown or black snakes. The green variants are especially difficult to identify. The common name of Chironius multiventris is cobra-cipó – liana snake. It is a non-venomous snake that grows to nearly two metres. The snake is diurnal and actively hunts for its prey in trees and on the ground. 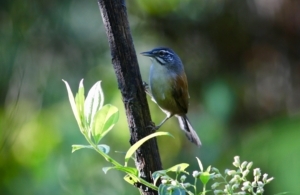 It preys – good news for you birders out there! – mainly on amphibians. The snake seen at noon right in the middle of the wetlands was 120 cm long and of a wonderful green colour with a blue shimmer reflecting from the sky above. 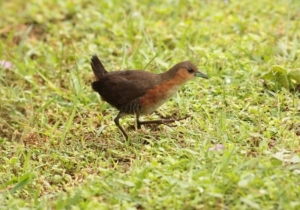 It was observed for a while and obviously distracted by hunting. With the growing number of species across many taxa in the wetlands the number of snakes will also increase. In intact Atlantic Forest habitat (without human snake killing) 80% of the snakes encountered will be nonvenomous. On a separate occasion the Seehawer family encountered another large green snake on Green Trail. This snake was possibly Chironius exoletus or Chironius bicarinatus, but they were not able to make a reliable identification as the colour and back marking was in between these two snake species. Give snakes their space and enjoy the rare adventure of seeing one. N.B. 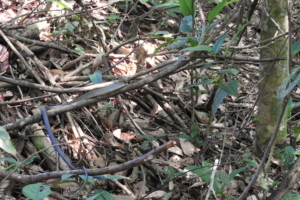 it should be noted that snakes are not easy to find at REGUA, their natural defence means they are well aware of human presence and will slip away rather than be found. 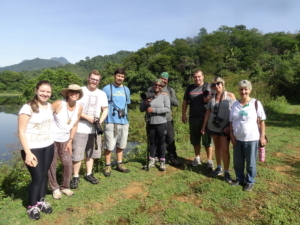 The Seehawer family are very experienced in finding snakes and walked in the forest with REGUA Rangers. Elias Faraht school in Cachoeiras Municipality has visited Regua in the previous two years and developed a regular visitation programme. This third seminar was (as previously) drawing on their interest in our restored wetlands. Using them as a base for interdisciplinary studies on hydrology, soil diversity, fauna and tree composition. The teachers organised the seminar which consisted of students aged 13-15 presenting their work to an audience of parents and school staff. The Seminar opened with REGUA`s slide presentation and ended with the REGUA GGV Project restoration video. Special thanks to Professor Denecir, Elias Faraht´s Headmaster and Teachers for the support and recognition given to the project and the wonderful opportunity to promote REGUA´s Conservation and Environmental Education work in the municipality.